In Today’s Dream11 Fantasy Cricket Prediction KKR vs RR 15th T20 Match IPL 2018 we will cover who will win the match on 18th April, predicted playing 11, pitch report of Sawai Mansingh Stadium, Jaipur, toss forecast, dream11 best team, the Best choice for captain and vice-captain. We will also cover players recent and past performance, playing condition, dream11 guru prediction, weather report of Jaipur, key players who are most likely to perform, where to watch the live match of Rajasthan Royals vs Kolkata Knight Riders and details of live streaming. You may like to read IPL Match Prediction. We have always mentioned that read the whole post as the data and statistics that we provide are almost 100% accurate. To win you need to give at least 5 minutes in reading the post. Many of our users have won in dream11 by just following our stats and data. Again we are repeating make sure to read the whole post thoroughly to get maximum benefits. To win any fantasy leagues you should have all the above information and we are giving all these info for FREE. Who Will Win the 15th Match of IPL 2018 Between KKR vs RR and Toss Prediction? Date: The match will be played on 18th April 2018 (Wednesday). Match: Indian Premier League, KKR vs RR, IPL 2018. Venue: Jaipur, Sawai Mansingh Stadium. Only one game was played at Sawai Mansingh Stadium in IPL 2018. The pitch is expected to be flat and lots of runs are expected in today’s match. Both the teams have pinch hitters so it is going to be a nightmare for the bowlers until and unless they bowl a very good spell. The batsmen may face problem in hitting the ball on the rise as the pitch will not have that much bounce. Today in Jaipur it will be a sunny day throughout the day and the sky will be clear. The last game played here was intervened by rain but no rain is predicted here on 18th April. The temperature is predicted to be 34-Degree Celsius and humidity to be 9% which may go up to 19%. Cricket fans can watch the full match today. If we look at head to head between RR vs KKR of last five matches you will be surprised to know that Rajasthan Royals won two matches out of five matches whereas Kolkata Knight Riders won one game. One game was tied and one match was abandoned due to rain. If we look at the entire encounters between these two teams RR has won six times while KKR managed to register only three wins. Star Sports has paid a huge amount of INR 16,347.50 Crores to get exclusive rights of IPL 2018 for live coverage for five years starting from 2018 to 2022. Star Sports has all the media rights including TV and all Digital Rights. You can watch the full match of Kolkata Knight Riders vs Rajasthan on Star Sports. D Arcy Short, Ajinkya Rahane (c), Ben Laughlin, Heinrich Klaasen, Jos Buttler (wk), Ankit Sharma, Sanju Samson, Shreyas Gopal, Ish Sodhi, Ben Stokes, Dushmantha Chameera, Rahul Tripathi, Mahipal Lomror, Krishnappa Gowtham, Jofra Archer, Anureet Singh, Dhawal Kulkarni, Jatin Saxena, Jaydev Unadkat, Aryaman Birla, Prashant Chopra, Stuart Binny, Sudhesan Midhun. Shivam Mavi, Dinesh Karthik (c & wk), Andre Russell, Javon Searles, Chris Lynn, Robin Uthappa, Ishank Jaggi, Cameron Delport, Sunil Narine, Piyush Chawla, Nitish Rana, Prasidh Krishna, Rinku Singh, Mitchell Johnson, Shubman Gill, Vinay Kumar, Kuldeep Yadav, Tom Curran, Apoorv Wankhade. Both the teams have won two games so far and ready to register their 3rd win. It will be interesting to see who will win today’s match. KKR and RR both the teams have managed to defend after batting first. What could be the possible changes? Rajasthan Royals have won the last match and they might not change the team but considering the fact that KKR has a line of good spinners Rahane may think of giving a chance to South African wicketkeeper-batsman Heinrich Klaasen a chance in place of D’Arcy Short. Jofra Archer will play in place of Ben Laughlin if he is declared 100% fit but till now there is no news of Jofra Archer playing. D’Arcy Short/ Heinrich Klaasen, Ben Stokes, Ajinkya Rahane (c), Ben Laughlin/Jofra Archer, Sanju Samson, Shreyas Gopal, Jaydev Unadkat, Rahul Tripathi, K Gowtham, Jos Buttler (wk), Dhawal Kulkarni. Kolkata Knight Riders have won the last match batting first, this might have boosted their confidence. All the players have performed fairly well in the previous game so why to fix if nothing is broken. KKr will not change their team until and unless they have some fitness issues before the game. Dinesh Karthik will go with the same playing 11 in today’s match. Robin Uthappa, Dinesh Karthik (C & WK), Sunil Narine, Kuldeep Yadav, Chris Lynn, Shivam Mavi, Nitish Rana, Piyush Chawla, Andre Russell, Shubman Gill, Tom Curran. Dinesh Karthik: In IPL 2018 Dinesh Karthik has scored 109 runs. He bats at 5th down. In the last game, he has scored 19 runs and contributed 19.5 fantasy points. 60.79% 0f the users have selected him in their dream11 team. Jos Butler: Butler has scored 58 runs till now in this season. He scored 23 runs in the last match and contributed 19.5 points. 39.29% of the fantasy users have taken him in their teams. Pro tips: Both the players are good. If you want to play safe take Dinesh Karthik on your team. If you can take risk keep Butler in your team because if Klassen plays Butler will open but this is just a prediction and it can be a risky move. For multiple teams make a combination of the above list. Ajinkya Rahane: Rahane got injured in the last game but he still managed to score 36 runs and contributed 24 points. He has scored 94 runs till now in this series. 64.99% of the users have selected him in their team. Chris Lynn: In IPL 2018 Lynn has scored 107 runs so far. He scored 31 runs in the last match and contributed 20.5 points. 83.66% of the users have taken him in their dream team. Robin Uthappa: Uthappa has scored 80 runs so far. He scored 35 runs in the last game and contributed 27.5 points. 57.85% of the users have selected him in their teams. Sanju Samson: Sanju Samson “Man in Form”. He has scored 178 runs till now. In the last match, he has scored 92 runs in 45 balls and contributed 63 points. 91.46% of the users have selected him in their fantasy teams. Nitish Rana: Rana has scored 127 runs so far in this tournament. He contributed 46 points and scored 59 runs in the previous inning. 80.91% of the users have picked him in their teams. D’Arcy Short: The Australian Batsmen is finding difficult to convert his scores. He has contributed 21 points in the last inning and scored 11 runs and took 1 wicket. 26.09% of the users have selected him in their teams. Pro tips: The above players are very important so make a combination of the above players in your teams. You can also take players from playing 11. Ben Stokes: At this point of the tournament, Stokes has scored 48 runs and took 1 wicket. He contributed 29.5 points in the previous game and scored 27 runs and took 1 wicket. 53.67% of the users have selected him in their teams. Andre Russell: Russell scored 153 runs and took 1 wicket so far in this season. He took 1 wicket and scored 41 runs in the previous inning and contributed 43.5 points. 87.86% of the users have selected him in their teams. Sunil Narine: Narine managed to score 72 runs and took 7 wickets in last 4 matches. In the last inning, he scored 1 run and took three wickets and contributed 33.5 points. 90.46% of the users have chosen him in their teams. Pro Tips: All the above players can take you to the first rank in dream11 or any fantasy leagues so try to make a combination of the above players. Kuldeep Yadav: So far in this IPL season Kuldeep Yadav has taken 5 wickets. He contributed 35 points in the previous game and took three wickets. 72.39% of the users have taken him in their dream11 teams. Jaydev Unadkat: Being a most expensive Indian fast bowler in IPL 2018, he has not proved is talent. He only took two wickets in this season so far. 44.79% of the users have chosen him in their teams. Piyush Chawla: Chawla took four wickets till now in this season. For today’s match, 45.59% of the users have selected him in their teams. Pro tips: The above players are most likely to perform. You can make a combination from the playing 11 also. Pro tips: The above players are most likely to perform. Make a captain and vice-captain from the above list. You can also select from the key players. Pro tips: You can keep the above players as captain and vice-captain. The past record of KKR is not good in Jaipur and Karthik will try to improve the previous records. On papers both the teams seem equal but Kolkata Knight Riders definitely have an upper hand in today’s match. According to our prediction, KKR will win today’s match. Both the teams have proved that winning a toss is not important to win any game but still the team winning the toss will love to bowl first. According to our astrology prediction, Kolkata Knight Riders will win the toss and they will ask RR to bat first. Note: Check the website one hour before the deadline for Best Teams and latest updates or subscribe to our notification to get the updates. The team will be uploaded before the deadline. 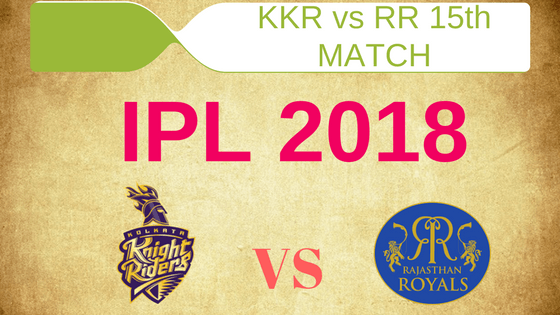 Conclusion: This is it for Today’s Dream11 Fantasy Cricket Match Prediction of RR vs KKR, 15th T20 Match, IPL 2018 which will be played on Monday 18th April. You can give your valuable feedback in the comment section. Subscribe to our notification of latest updates. GOODBYE! Hey we will update it before the deadline. CAN you guys please update today’s ipl match dream team, KXIP vs SRH. I have been waiting. Can you guys do it soon. We will update from Sunday’s match. Currently, we are facing some technical problem.